Y Combinator-backed financial service ReadyForZero, which focuses on helping Americans pay down their $2.5 trillion in personal debt, is expanding its feature set today to include online payments. The new addition, a part of ReadyForZero Plus, will detect when you have new deposits in your bank account, and will then immediately advise you how to spend that money to more quickly pay off your loans, credit card bills, and more – before it burns a hole in your pocket. The feature takes advantage of the service’s analytics which help users better understand their financial standing and how their spending behavior impacts their ability to get back on track. While the startup isn’t revealing its user numbers, CEO Rod Ebrahimi says that it has now helped Americans pay down over $25 million in debt, and is growing its user base 5-10% month-over-month. This latest addition aims to better automate one of the most important parts of paying off debt – actually making the payment. With online bill pay, the startup now offers a service that’s somewhat similar to what most banks do today, in terms of being able to electronically transmit payments from a checking account, to pay down your credit card debt, mortgage, auto loans, or student loans, as the case may be. 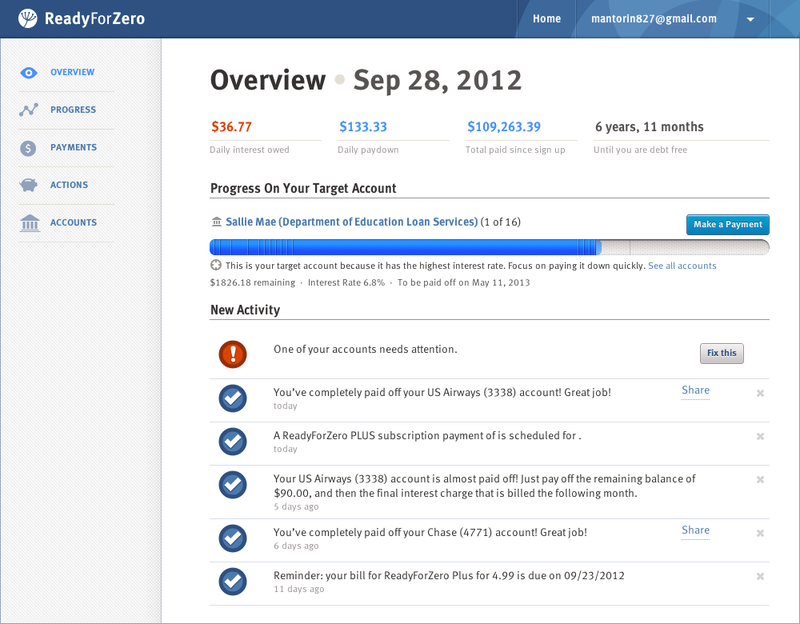 The only drawback to ReadyForZero’s system is that it can’t, at the moment, pay off debt which doesn’t support online, wired payments – such as debt held with the IRS, for example. But that may change in time – the online payments system was four months in the making, so it had to start somewhere. The system sends out emails that inform users that, for instance, an extra payment of $50 right now will save them $X in interest. This feature will soon be updated to be automated on a monthly basis and will then be added to the company’s mobile app. 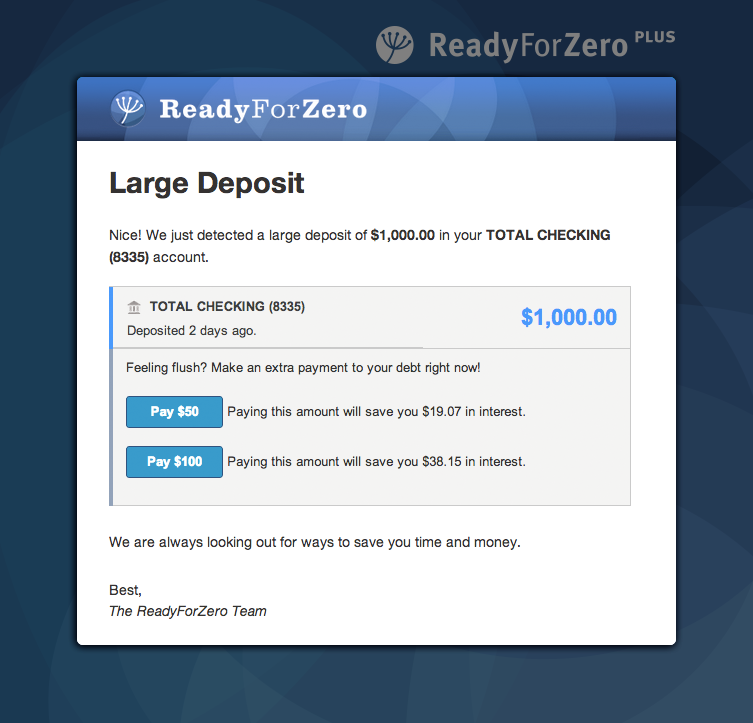 ReadyForZero is a free service, and the new payments functionality is available as a part of ReadyForZero Plus for $4.99/month. The startup has $4.78 million in funding from YC, Polaris, Citi Ventures, and others, following its $4.5 million Series A in 2011.